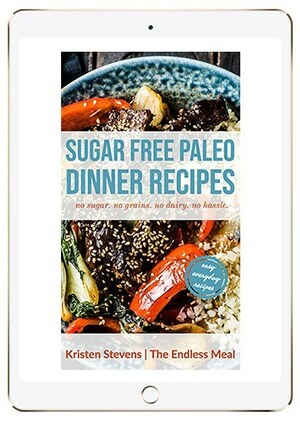 How could I say no to an offer to review Grace Massa Langlois's new cookbook Grace's Sweet Life? Impossible, I know. I'll admit that I don't have a big sweet tooth, but I do love to indulge occasionally on a rich and decadent dessert. Grace's Sweet Life has recipes for (what seems like) every classic and delicious Italian dessert there has ever been. Ok maybe not every recipe, but 180 pages of them. I've been eyeing out the gorgeous looking Torta Sette Strati or Seven-Layer Cake. Many of the recipes include a photo and, although not of the highest quality, they do show you what the dessert will look like, and tease you into wanting to eat it; as food photos almost always do. I'll let you in on a little secret: I've always been a little intimidated by profiteroles. Not eating them, of course, but making them. They always seemed so light and fluffy and perfectly impossible to make. Grace's recipe has changed my mind. Make sure you stop by and say hi to her on her blog Grace's Sweet Life! If you make Profiteroles with Chantilly Cream make sure to snap a pic and tag @theendlessmeal on Instagram so I can like and comment on your photos. I love seeing TEM recipes you create. Preheat the oven to 425°F (220°C). Line 2 rimmed baking sheets with parchment paper or silicone baking mats. Transfer the choux pastry to a large pastry bag fitted with ½-inch plain tip (like Wilton 1A). For larger profiteroles, pipe the paste into 1½-inch rounds, spacing 3 inches apart on the prepared baking sheets. For smaller profiteroles, pipe the paste into 1-inch rounds, about 1 inch in diameter, spacing 2 inches apart on the prepared baking sheets. To prevent the tops from burning, level the peaks with a wet fingertip. Bake one sheet of profiteroles at a time. Using a small spray bottle filled with water, lightly spritz the profiteroles with water and immediately place in the oven. The water will help to create steam, which helps give the profiteroles volume. Bake until tops and sides are golden, 25 to 30 minutes for larger profiteroles and 15 to 20 minutes for smaller ones. 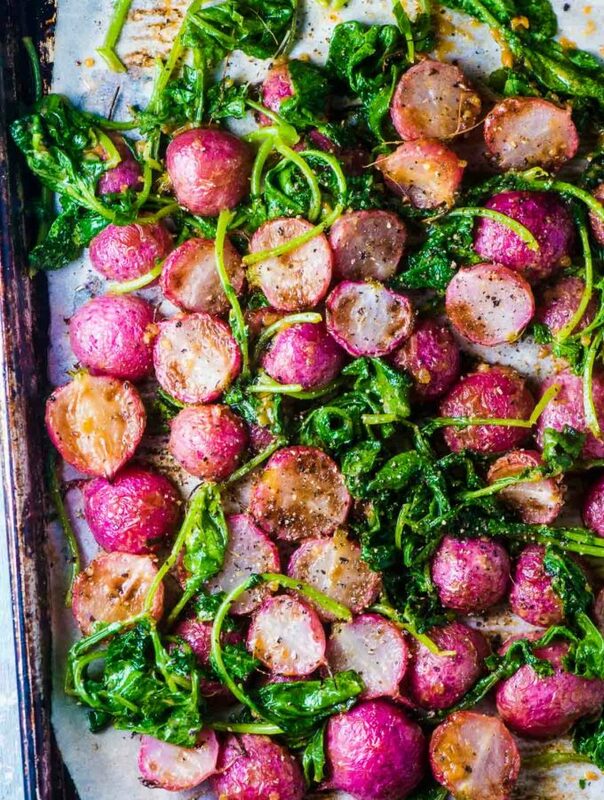 Turn off the oven and allow to rest in the oven for 5 minutes. Remove from the oven. Pierce each profiterole in the side with a small paring knife to allow steam to escape. Transfer to a wire rack and allow to cool completely. With a serrated knife, cut each profiterole in half crosswise. Transfer the chantilly cream to a large piping bag fitted with a large tip (like a Wilton 1M). Pipe the cream in a decorative swirl on the bottom half of each profiteroles. Replace the tops. To serve, dust with confectioners’ sugar. 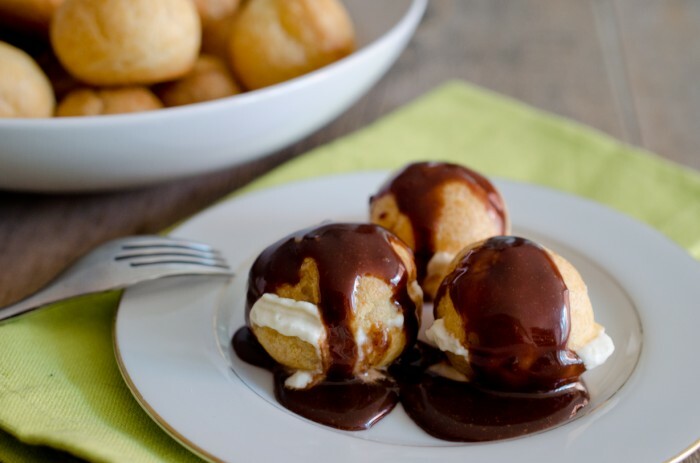 If not serving immediately, filled profiteroles can be stored in an airtight container in the refrigerator for up to two hours (any longer could cause the pastry to go soggy). Crema chantilly is very delicate. For best results, prevent the loss of volume by whipping the chantilly cream just prior to using or by storing in an airtight container in the refrigerator for no longer than 3 hours before using. For the best flavor, combine the cream and the vanilla bean and seeds in an airtight container, then cover and refrigerate for 24 hours. If you do not have time to allow the vanilla bean to infuse in the cream, substitute 1½ teaspoons pure vanilla extract. For best results, chill the mixer bowl and whip attachment (or bowl and beaters or balloon whisk) for 30 minutes prior to whipping the cream. If you’re whipping the cream on a warm day, while beating, set the bowl in an ice water bath to keep it cold. Combine the cream and the vanilla bean and seeds in an airtight container. Stir to combine. Cover and refrigerate for 1 hour, or preferably 24 hours, to allow the vanilla to infuse. At least 30 minutes before whipping the cream, put the bowl and whip attachment of a stand mixer in the freezer. Just prior to whipping, remove the vanilla cream from the refrigerator and strain through a fine-mesh sieve into the cold bowl (discard the solids). Fit the mixer with the whip attachment and begin beating the cream at high speed (to immediately incorporate air) until soft peaks (curl when attachment is lifted) form, about 2 minutes. Reduce the speed to low and gradually add the confectioners’ sugar. Increase the speed to high and continue beating to stiff peaks (stand up straight when attachment is lifted), about 2 minutes longer. If not using immediately, transfer to an airtight container and refrigerator until ready to use, no longer than 3 hours. Pasta choux (choux pastry) is a precooked paste that is shaped and baked in the oven. Pasta choux paste is simply made by cooking water, flour, and eggs and vigorously stirring until smooth. The soft paste is piped from a pastry bag to create different shapes. 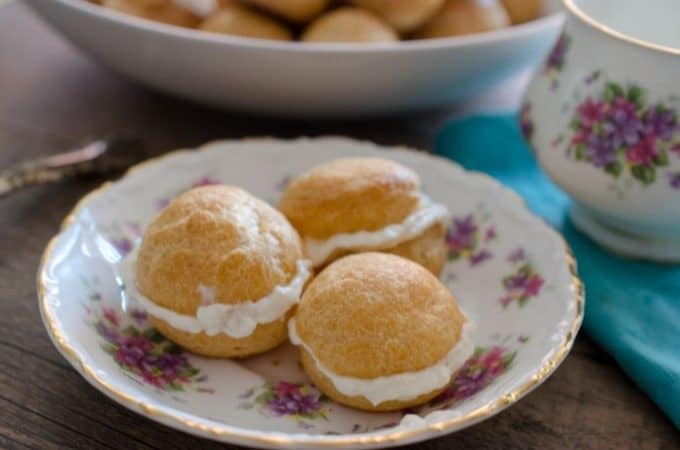 During baking, steam releases from the dough, causing it to expand into a light and crispy hollow shell often referred to as a “bun.” The more popular shapes are the bignè (cream puffs or profiteroles) or éclairs. The buns are often filled with various creams like Crema Chantilly (page 12), Crema Pasticcera (page 10), or gelato. The filled buns can be simply topped with confectioner’s sugar or more decadently with crema ganache (chocolate ganache), caramel, or fruit coulis. Choux buns can be made in advance but should be filled just prior to serving. Store choux buns in resealable bags at room temperature for up to two days or in an airtight container in the freezer for up to one month. 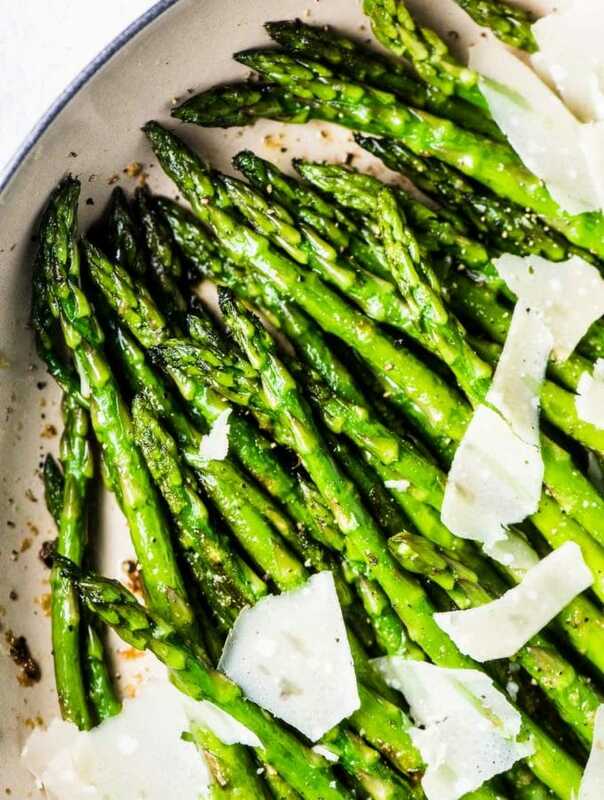 When ready to use, defrost and warm in a preheated 350°F (180°C) oven for a few minutes until crisp. In a medium saucepan, bring the water, butter, sugar, and salt to a rolling boil over medium-high heat, stirring gently with a wooden spoon. When the mixture begins to boil, add the flour all at once and stir vigorously until the paste reaches an internal temperature of 175°F (80°C), pulls away from the sides of the pan, and forms a ball, about 1 minute. Remove from the heat. Allow the paste to cool, stirring a couple of times, to a temperature of 120°F (50°C), about 2 minutes. Add the eggs one at a time, making sure each egg is well incorporated before adding the next, stirring vigorously until well combined and the paste is smooth. Hi Kristen. Well I made the choux pastry ok but when they came out of the oven, some of them were large but nearly flat. Where did I go wrong? I’m wondering if maybe they were taken out of the oven a little too soon. I have actually had that happen to me and it was when I pulled them out early. Try tapping on the top of them to see if they are firm or soft. If they are soft then leave them in for another minute or two. This was my moms favorite dessert! Although she liked vanilla ice cream, rather than cream with the chocolate syrup. It always reminds me of her. Your profiteroles are dazzling, an enticing dessert. I have never had a profiterole! This looks like the perfect recipe to try. Bookmarking it now for serving at a future book club gathering. Oh Tricia you are in for such a treat! You are going to love them!! i haven’t had a profiterole in a long time. thanks for reminding me! I finally baked profiteroles a couple months ago, although mine were only dipped in chocolate. Chantilly cream up next. Definitely. I’ve always been too intimidated to try making these-I’ve bookmarked this and will give it a try! Don’t be! I was before I made these but they are very very easy to make! 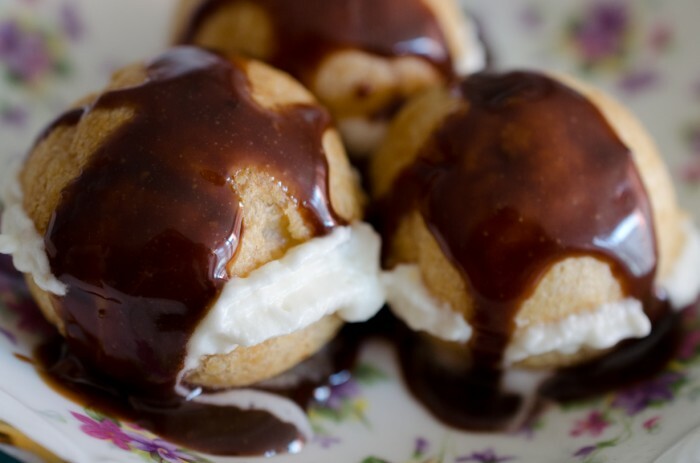 I have never had a profiterole before and from looking at your images I must make them and try them for myself! They look simply delicious!! Thank you! I’ve tried the recipe and my family loves them! Oh no, profiteroles are my weakness! These look wonderful!